HumUnity Center at Our Savior Lutheran Church, 1132 W. Southern Ave. The Disability Justice League West Michigan is a collective group of people with disabilities and our allies committed to disability rights and disability justice in the West Michigan area. This group will be consumer controlled (disability-led) with room for every type of advocate and every kind of advocate is needed! Touch Writer Voting Machine Experience! United Way, 31 E. Clay Ave. Writer is secure, accurate and easy-to-use. 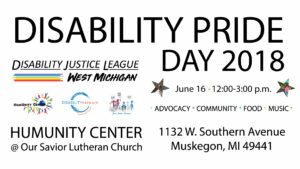 The disability community – people with disabilities and their allies – will gather at the Humunity Center Muskegon on Saturday, June 16 to celebrate Disability Pride Day. This is an opportunity to educate ourselves and others about relevant and pressing issues and to demonstrate that our voices are critical to current policy debates. 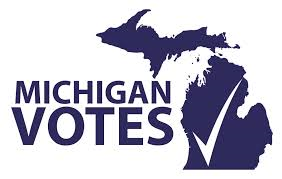 VOTING IN MICHIGAN PRESENTATION AT THE OCEANA COUNTY FAIR! 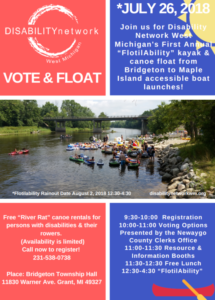 A non partisan “Voting in Michigan” Presentation by The Oceana County Clerk’s Office will be held in the Oceana County Fiar Education Building at the Disability Network West Michigan’s Booth . 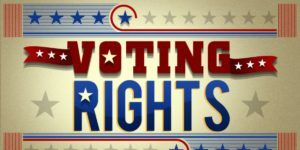 Staff will be on hand to help anyone interested in registering to vote, during fair hours! 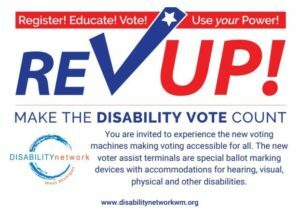 With the support of MIDSA, Michigan Developmental Disabilities Council and Self Advocates of Michigan are co-hosting training seminars focusing on voter rights and accessibility for people with disabilities. These seminars are free and open to everyone. Frauenthal, 425 W. Western Ave.
Tuesday, November 6 at 7 p.m. The Community Foundation for Muskegon County is presenting internationally renowned speaker, author, and educator, Dr.
Come join a peer group open to all Veterans with disabilities regardless of branch of service, length of service, rank, gender, or type of disability. (Free lite lunch served) GROUP MEETS THE 2ND WEDNESDAY OF EVERY MONTH FROM 1:00PM – 2:30PM. April’s group will be held at the USS Silversides – Hope to see you there! NORTHSIDE PUB 20% GIVE BACK NIGHT! Northside Pub, 2353 Holton Rd. You are invited to a Northside Pub 20% Give Back Night to benefit Disability Network West Michigan! 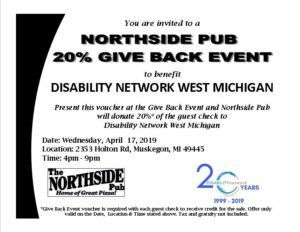 Print and present this voucher at the Give Back Event and Northside Pub will donate 20%* of the guest check to Disability Network West Michigan. *Give Back Event voucher is required with each quest check to receive credit for the sale.